MSNBC is hitting back at charges (considered by some a bit thin) that their morning hosts are in the tank for Trump . 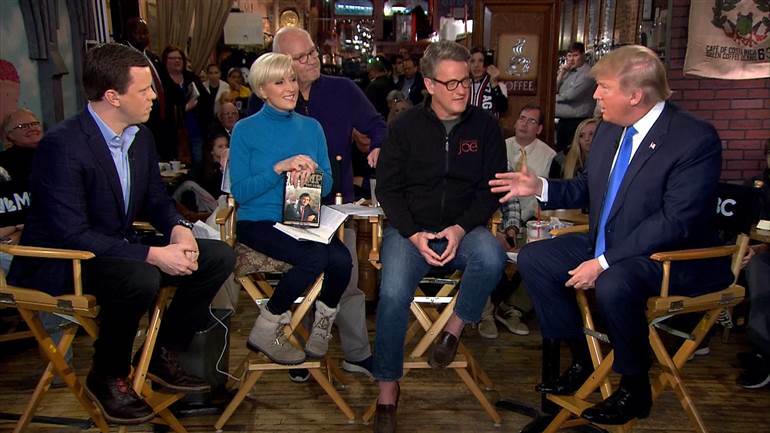 By scheduling a surprise prime time Trump town hall, moderated by Joe and Mika, directly opposite CNN’s GOP town hall, MSNBC is doing more than just serving up payback to CNN. This is also a middle finger to CNN town hallers Ted Cruz and Marco Rubio, two sitting Senators bigfooted by Joe and Mika’s audacious counter-programming stunt. MSNBC is betting their new best friend Trump wins the nomination, thereby making him titular head of the Republican Party. That would give the long-time “liberal” network an entré it has lacked into GOP respectability, aiding their attempts to build up fairness cred. And if Trump and Fox News are still at war, even a cold one, that might give MSNBC some extra leverage in bookings and the like. Of course Trump might not get the nomination, and then MSNBC will have pissed off just about every GOP candidate except Donald Trump. That would only further isolate MSNBC from the GOP establishment. They’re out on a limb here, and that’s a precarious spot to be rolling the dice. Especially if they aren’t loaded in your favor.